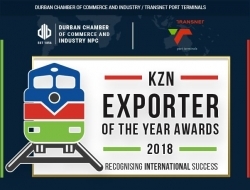 The Durban Chamber of Commerce and Industry, in partnership with Transnet Port Terminals, is proud to announce the nominees for the 2018 edition of the KwaZulu-Natal (KZN) Exporter of the Year Awards. Award winners will be announced at the 2018 KZN Exporter of the Year Award Banquet to be held at the Durban ICC Arena on Thursday, 04 October 2018 as part of Export Week in the first week of October. KwaZulu-Natal is South Africa's second largest provincial economy, contributing almost one-fifth of the country's gross domestic product (GDP) and exports are a cornerstone of our regional economy as the province is strategically positioned by being home to two of Africa's busiest and largest ports, Durban and Richards Bay. KwaZulu-Natal major exports include steel, iron, aluminium, metal products, vehicles, automotive components, chemicals, varying chemical products, mineral fuels, oils, mechanical appliances and electrical equipment, machinery, paper and pulp. Additionally, KwaZulu-Natal's manufacturing sector is the second largest in the country with nearly a third of South Africa's manufactured exports produced in the province in key industrial and manufacturing zones located throughout the province. Exports not only improve the balance of trade by earning foreign revenue; they also boost domestic manufacturing demand which creates jobs and develops skills. Durban Chamber President, Musa Makhunga, said that the 2018 Exporter of the Year Awards, which is now in its 18th year, is an important event as the Awards highlight a key area of our economy and showcases the efforts of the nominated companies in driving economic growth and job creation in our region. "KwaZulu-Natal exports a wide range of goods and services and exports play a pivotal role in maintaining and developing sustainable economic growth in KwaZulu-Natal and South Africa. These awards aim to recognise and celebrate exporters in this province, to highlight the success of local businesses as well as to stimulate the growth of the economy by encouraging other business to strive for similar achievements. Ultimately, our other goal is to encourage new entrants such as entrepreneurs and SMMEs and to help existing exporters grow their businesses and develop the businesses into new markets and geographies," said Makhunga. The awards are held in partnership with Transnet Port Terminals; a key enabler of exporters and the country's leading terminal operator responsible for commercial import and export. "If we hope to achieve economic growth similar to some of our BRICS counterparts, we have to remove barriers of entry so that more small and medium enterprises can play a meaningful role in growing our economy. This calls for increased enterprise development efforts on the part of established business. Incubators, mentorship programs and guided coaching for entrepreneurs are some of the mechanisms that can be employed to support emerging entrepreneurs. Let us open doors to more newcomers in these awards so that we can create a truly inclusive economy" stated Nozipho Sithole, Transnet Port Terminals (TPT) Chief Executive. The Durban Chamber is running the 2018 Exporter of the Year Awards in partnership with strategic partners that include Trade and Investment KwaZulu-Natal (TIKZN), Small Enterprise Development Agency (SEDA) and the Export Credit Insurance Corporation (ECIC). "TIKZN is proud to be associated with the Exporter of the Year Awards, which allow us to honour and give recognition to KwaZulu-Natal Exporters who have excelled and increased their propensity to export. This, in turn, has a positive impact the balance of payments in our country and contributes to the much need jobs in our province", says Lester Bouah, Executive Manager: Exporter Development and Promotion at TIKZN. Award winners will be announced at the 2018 KZN Exporter of the Year Award Banquet to be held at the Durban ICC Arena on Thursday, 04 October 2018 as part of Export Week. Tickets are available at the following rates for Chamber members: R 11 000 per table or R 1 250 per seat or for non-members: R 12 000 per table or R 1 400 per seat. We invite all to join us in recognising these businesses who have made their mark in the competitive export market and are putting KZN on the international map and contributing to our regional and national economy. For further information email booknow@durbanchamber.co.za. Transnet Port Terminals (TPT) is South Africa's leading terminal operator responsible for loading and offloading cargo aboard vessels calling the seven South African ports. Boasting a staff complement of over 9000 across 16 cargo terminals, TPT's operations target four major market sectors namely: automotive, containers, bulk and break bulk. Nozipho Sithole is the Chief Executive responsible for realising the new Transnet 4.0 strategy which is aimed at repositioning the business as a facilitator of trade and among the world's top five in the next five years. Current plans are focused on geographic expansion, service innovation and diversification aided by competitive approaches hinted by the fourth industrial revolution. For information, visit www.transnetportterminals.net.